[prMac.com] Bartlett, Illinois - Creative Algorithms, developer of award-winning mobile software, is pleased to announce the update of our iPhone/iPod touch application, Date Wheel date calculator, now optimized for the larger screen on the new iPhone5 and 5th generation iPod touch. Calculate the time between two dates in days, weeks, business days, and months. Set up a countdown to an important date, determine if a project is overdue, or track how long a task is taking. The unique user interface automatically updates the oldest field, with locks available to keep one field constant. Save calcs for future reference. 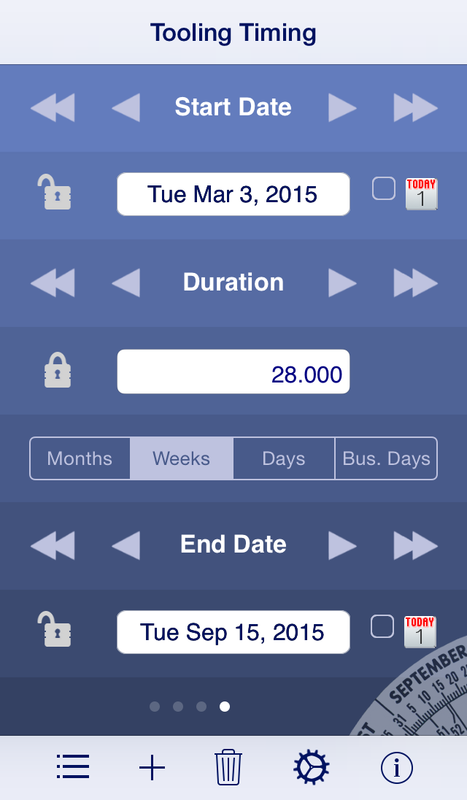 Easily figure out the time between two dates with Date Wheel on your iPhone or iPod touch. Date Wheel is the electronic version of the plastic wheel-shaped calendar commonly used by businesses to calculate lead times, but it can be used in numerous applications, for both professional and personal needs. Calculate completion dates for projects, track when a shipment will arrive, determine how long something has been overdue, or find the Julian date. Figure out your baby's due date, schedule your next haircut, find out what day of the week you were born, or set a countdown to an important event. DateWheel is commonly used in the automotive, construction, and medical industries, as well as by lawyers and other professionals to compute date deadlines. According to Harv Laser, editor of the former Handheld Computing Magazine, "(Date Wheel) is a useful tool for project planning, time management, ... estimating lead times, ... (to) count down to an important event, estimate shipping and arrival times, determine the exact age of a relative or friend... Ever try to calculate these kinds of things in your head?" Date Wheel(tm) date calculator is available on the iTunes AppStore for $2.99 (USD). The software tool is also available as a web app. Based in Chicago, Creative Algorithms has been developing personal and business mobile applications as early as 1999. Applications are designed for iPad, iPhone, and iPod touch. Focusing on functional and beautifully polished user interfaces with high quality standards, Creative Algorithms has established a strict design philosophy for development of its products, and strives for exceptional customer service. All Material and Software (C) 1999-2012 Creative Algorithms, LLC / All Rights Reserved. Apple, the Apple logo, iPhone, iPod and iPad, are registered trademarks of Apple Computer in the U.S. and/or other countries.